Since the outbreak of civil conflict in April 2015, thousands of Burundians have sought refuge in neighbouring countries. 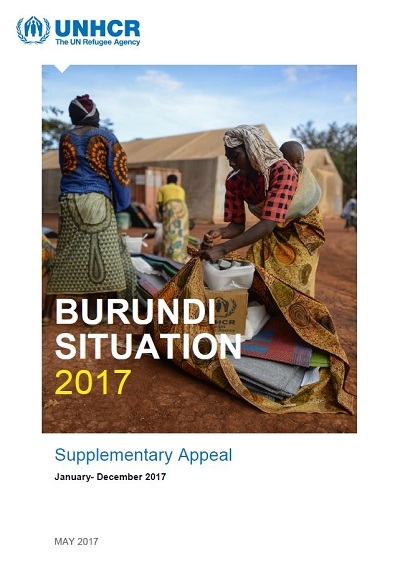 As of the end of April 2017, more than 420,600 Burundian refugees had fled to the Democratic Republic of the Congo (DRC), Rwanda, Uganda and the United Republic of Tanzania, with over 120,000 having fled to these countries in 2016. While many seek refuge abroad, internal displacement remains relatively low despite a potentially explosive situation within the country, with worsening humanitarian and socio-economic indicators. The human rights situation inside Burundi is volatile. Refugees fleeing Burundi have reported human rights abuses, fear of persecution, and sexual and gender-based violence (SGBV) as some of the reasons for their flight. International efforts at encouraging dialogue towards a resolution of the crisis have stalled. As the overall political and economic situation remains fragile with no signs of improving in 2017, it is expected that people will continue to flee to neighbouring countries, mostly to the United Republic of Tanzania, where some 249,000 refugees are already accommodated in three camps, namely Mtendeli, Nduta and Nyarugusu. The Office expects that another estimated 124,500 people will likely seek refuge into neighbouring countries by the end of 2017, bringing the total to 534,000 refugees since April 2015.